We were all ready and waiting to see it happen. We all grew up. I went to college. Gradated. Got married. He became a handsome teenager and was still wining over hearts (everyone loved him and that big smile). He joined a church band. Got his associates degree before 15. He had friends and a family who loved him. Then one night, he ran out of his house—his parents running after him—to the bridge that went over highway 95...and jumped. As a mother, I can't imagine that moment—that split second when you are looking at your child and his feet are solidly on the ground and he is so close to being within reach and that defining, heart breaking moment when he isn't any longer. It had been the week of Easter. It was a beautiful celebration of his life—a life that ended far too soon. The loss of someone to suicide happens everyday. Every minute. It is estimated that worldwide nearly a million people take their own lives. One million fathers, mothers, sisters, brothers, sons, daughters who are lost because they had no hope left. The day I found out about this brilliant young man's suicide, I was brought back to a moment years earlier, when I was 11 years old and standing on a chair with a noose dangling in front of me. I had stepped down from that chair that day—despite bruises, pain, loneliness, and secrets—and lived. Lived to see heart breaks, awards won, graduations, friendships, jobs, and a million other happy and terrible moments. Ugly or perfect, those moments were mine and there I stood in my kitchen with my round and pregnant belly and listened as my mother told me the news about a boy who had all those moments taken away. This novel isn't about happy endings. It isn't about happily-ever-afters. It is about the beautiful and terrible moments that make up a life and the possibilities that live in even the darkest of places that sometimes we are just too blind to see. 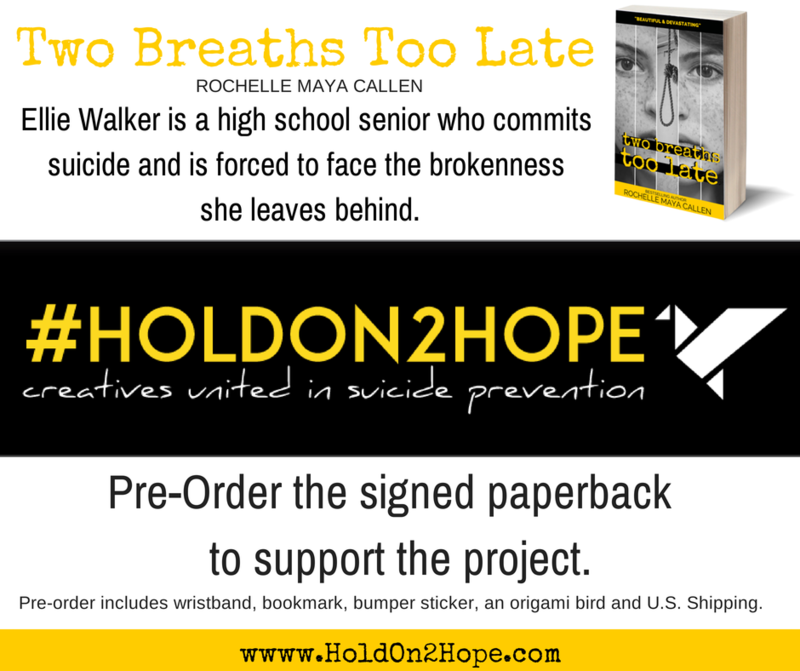 I will use a portion of the proceeds from this novel to donate to To Write Love On Her Arms as well as launch a suicide prevention project entitled, HoldOn2Hope. The project will launch in September. If all goes well, there will be a LIVE event for teens in the DC metro area as well as the project's online media awareness component will last a full year. My heart is in this project and I know that a project like this needs a ton of love and support to thrive. That's where you come in. I hope together we can change this staggering statistic. I send you love and light today. Please know that you are precious in this big 'ol world and it would not be as bright or beautiful without you in it.